Yes, salad dressing. You never suspected these things to be in your dressing, did you? Did you know that most store bought salad dressings are often loaded with corn syrup and other junk ingredients? Any conventional Ranch dressing most likely contains soybean oil, modified corn starch, xanthan gum, phosphoric acid, monosodium glutamate, calcium disodium (EDTA), polysorbate 60, disodium guanylate, soy lecithin. Let’s break those down. •Soy is higher in phytoestrogen than any other food. Phytoestrogens are plant based estrogen that mimic the estrogen in our body. Consuming high amounts of phytoestrogen, is the leading cause of breast cancer, endometriosis, uterine fibroids, infertility and low libido. •Soy is also the king of cell Goitrogens (thyroid suppressors). •Phytlates found in soy block mineral absorption. •Also found in Soy, Trypsin inhibitors, inhibits proper digestion of protein. •93% of Soy is genetically modified. Modified corn starch is made from corn. As of 2012, 94% of non-organic corn is genetically modified. MCS is a derivative of corn, chemically altered to dissolve quickly and act as a thickener. This ingredient may trigger individual allergic reactions including : headaches, gastrointestinal discomforts such as bloating and diarrhea. This is a corrosive chemical that can be irritating and even burn the eyes, nose and throat. It is suggested to avoid skin contact and to wear protective gear (acid resistant clothing, gloves and a face shield) when handling this chemical. These ingredients are used as flavor enhancers. •MSG has been labeled as an excitotoxin because it is thought to have the ability to overstimulate cells to the point of death. Some people link MSG to headaches, flushing, poor concentration and diseases like fibromyalgia. Research has documented effects of MSG causing burning in the mouth, muscle fatigue, stomach upset, obesity and hormonal fluctuations. •Disodium Guanylate is often derived from seaweed or fish. It is mostly harmless on its own. When it is combined with MSG and Inosinate, it is recommended to be avoided by people suffering from gout or uric acid kidney stones. This is used in salad dressing to “protect quality”. EDTA is also found in cosmetic products and can cause: allergic reactions, asthma attacks, skin rashes and possible kidney damage. Polysorbate 60 is found in food, medicine and cosmetics and can cause detrimental reproductive effects, organ toxicity and cancer in high doses. 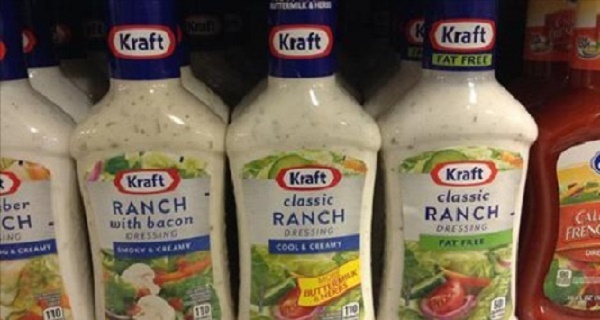 One bottle of ranch can very from another pertaining to its ingredients. Always read the labels and try an organic version if you would like to avoid these harmful ingredients. Or ideally, you could make your own with the Healthy Organic Ranch Dressing recipe I have included for your enjoyment. Very slowly, add the oil so that it emulsifies. Use 2 tsp of fresh herbs like dill, mint, or basil for alternate flavors. Use organic avocado instead of yogurt if you don’t tolerate dairy.